I am simply amazed at the progress Asha and Nikko are making. I was supposed to go into work today, but we had an ant attack in the bathroom so I had to clear up the second bedroom and kitty proof it so Nikko could go there. Once I moved him, I was surprised to hear Asha outside the door crying like Nikko does when he's lonely. As it turns out, much of her previous hostility towards Nikko indeed gtave way to curiosity. 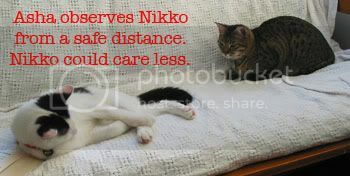 She would run in to a safe distance with Nikko. Hiss at him. Bat at him w/ her claws in as if to test him. He would completely ignore her (except for when her tail twitched, then he'd pounce on that like a toy, upseting asha quite a bit). Once asha sufficiently worked herself up, she'd retreat out of the bedroom, only to come back crying through the door in another 5-10 minutes. Since I was home today, I decided I could nurture this behaviour. I was at the ready with a towel in one hand and a squirt bottle in the other. I did have to take Excedrin tension headache, because I was so stressed out about them meeting I developed a migraine. Finally with about four hours of this behavior this occurred. I should mention that when I realized they were going to be meeting today, I employed the vanilla extract trick. 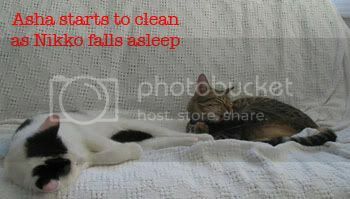 A dab of vanilla on the chin, back of the neck and base of the tail of each cat. Evan will be so pleased by our kitties. The stress of them at odds has been keeping him up at night. Nikko does have some sleeping habits that Asha has given him weird looks for. He "runs" in his sleep, so his feet kinda kick Asha at times. He also lets out weird howls sometimes while asleep that wake Asha up. I know that this doesn't mean they're completely good from here on out, and I'll probably still separate them at night and when I leave the house for a while. But really, I'm so incredibly enthused at their progress that my migraine has almost dissappeared, and I may get back to studying for the psych gre yet! Just wanted to share my joy. I'm so excited to see people place themselves on my map. I know it's hard to place your pin exactly, but as long as people get somewhat close, I'm happy! If you have no idea what I'm talking about, look at yesterday's entry!! I started spinning a yarn for the prize. It looks sweet and yummy! literally. aw they are so cute!! 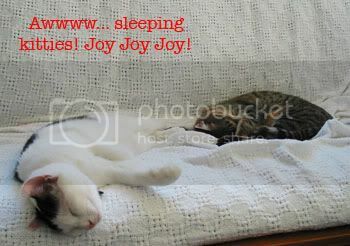 Your cats got along so well so quickly! when I brought home a kitten my then 14 year old cat would hit him knocking him over. now they get along well enough to sleep next to eachother but they still fight sometimes. thank you so much for the card and magnet! that was so sweet of you. 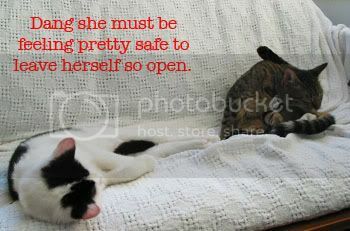 I have a kitty contest over at my blog if you want to enter your kitties in it! hehe love those pictures. they are sooo cute! great progress the two. probably end up best of friends in a bit. You must tell me about this vanilla thing...I do not get it...Why would one use such a trick? I've never heard of the vanilla thing either - what's up with that? soo cute! Love your dying tutorial too--I've been wanting to do that forever.